Can you tell how many carats a diamond weighs? Perhaps you just got engaged and are wondering ‘how big is my diamond?’ There is a noticeable difference between a 1/2 carat, 1-carat, and 2-carat diamond. However, knowing the exact weight of a diamond is nearly impossible without a scale. We’ll show you an effective beginner method for how to measure carats on the fly. All you’ll need is a millimeter gauge and the chart below to get started. Usually, dealers sell estate jewelry ‘as-is,’ which means the stones are in their original settings. A scale is inaccurate if the jeweler doesn’t remove the gemstones. Getting an exact carat weight is difficult in this case. With set diamonds, jewelers use a diamond mm to carat weight calculator to approximate a carat weight. If you just need a quick estimate, a diamond carat chart works, too. First, measure the diameter in millimeters. This measurement will help you determine the approximate carat weight. Either input that measurement into a diamond weight calculator or use a diamond weight chart to match the diameter with carat weight. The chart below references the measurements of the diamond in millimeters and from there gives you an approximate carat weight. If it’s a fancy shaped diamond, you’ll need the length and width in millimeters to find an estimated weight. This chart applies to diamonds that are modern calibrated cuts. Also, when dealing with antique diamonds, it takes more expertise to give an accurate estimate. 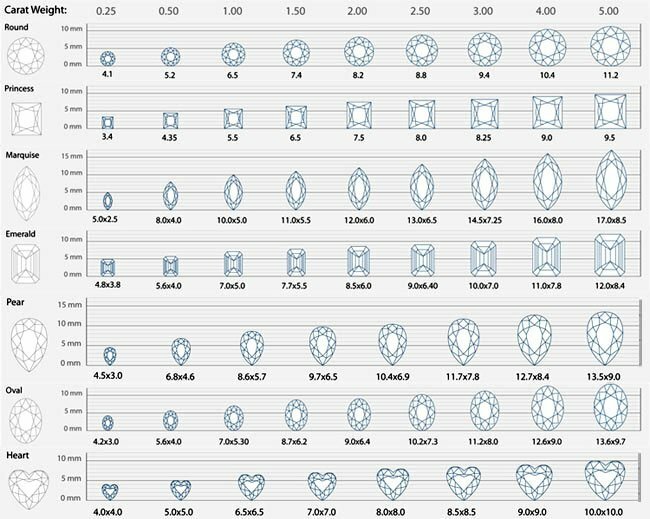 The girdle thickness, the height of the crown, and overall depth of the diamond can significantly impact carat weight and this chart’s accuracy. Also, remember that every gemstone has a different size-to-carat ratio. The chart above will not be accurate for other stones like amethyst or garnet. We hope this quick and effective beginner method will help you estimate carat weight when shopping for estate jewelry. For more accurate carat weight calculations, antique dealers will also use special tools to get the height of the stone and consider several other factors.